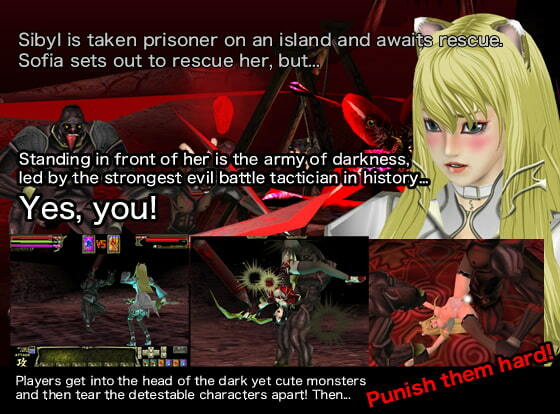 Real-time 3D total violation fantasy SKUNK2 Half-elf & mage edition (English translated version)! A den of monsters on a secluded island in the southern seas. Sofia’s newly formed group of mercenaries hears the news of Sibyl’s disappearance. Will Sofia be able to safely rescue Sibyl? Sibyl from the previous installment is joined by Sofia and some new monsters. Three times the scenes added as well! A huge upgrade of content. Original story and characters. New Features 1. Changeable camera angle, even during battles. 2. Transparent monster mode added. 3. New card system battle system. 4. Multiple scenarios. 5. Switch between full screen and windowed mode. Latest Version ver1.04 Latest Demo Version ver1.03 Please be sure to check that the demo version plays on your computer before purchasing. NOTICE: The bug (Director Player Error) is fixed on September 17th. If the version of the game you have is 1.03, download the game again from Download History in MyPage.